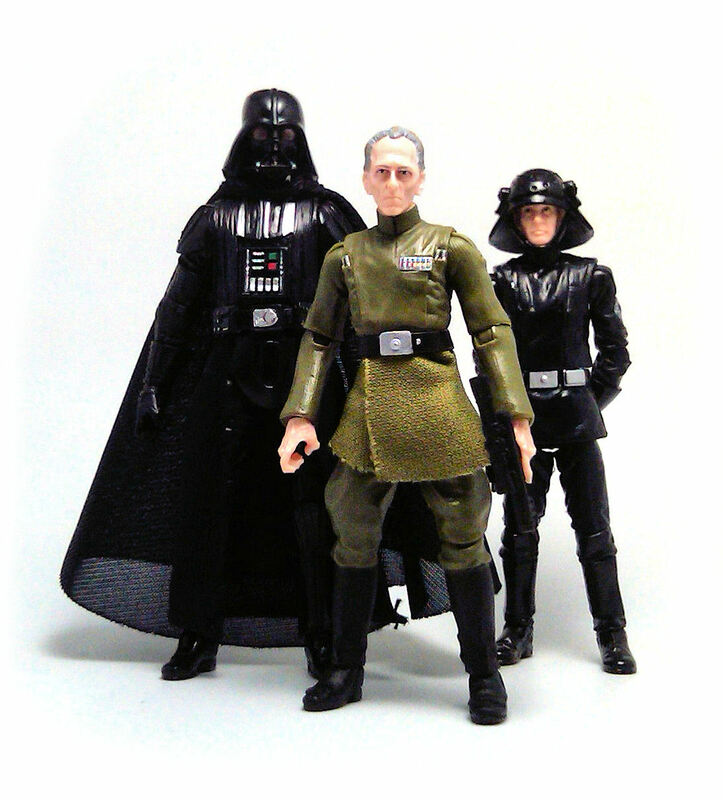 Well, if there ever was one character I absolutely thought that belonged in the Star Wars Vintage Collection by Hasbro, it is Grand Moff Tarkin. 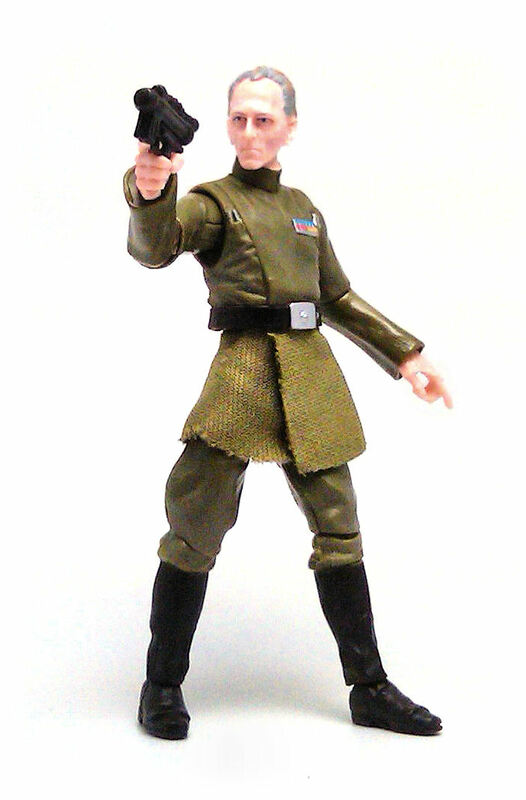 Unfortunately, the only version of Tarkin that was available for a while was the one debuted in the Revenge of the Sith line, back in 2005, a mold that was repainted at least a couple of times for the Comic 2-Packs and the Death Star Briefing Room Set. Thankfully, for 2012 Hasbro saw fit to develop a brand new sculpt for the 2012 Grand Moff Tarkin (VC98) figure and for the most par it is a very good one, despite a couple of design issues. For a start, the color of the uniform seems incorrect. 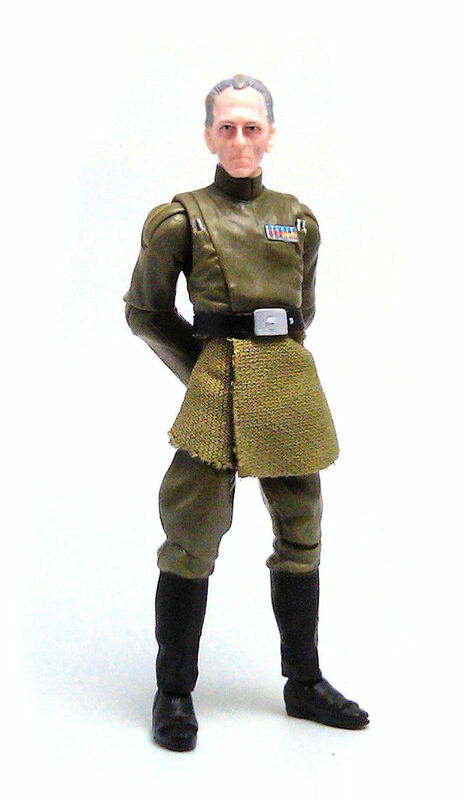 I don’t recall Tarkin’s uniform to be so green on the screen, but I’m willing to cut Hasbro some slack because it is still a nice shade of green that could pass off as a military hue. The other point of contention is the use of a fabric skirt piece to simulate the lower edge of the tunic. Now, to be honest, in real life it doesn’t look so bad, but in close up photos the un-hemmed edge of the fabric is much more conspicuous than it really is. With that out of the way, I must say that the level of the sculpted detail on this figure is simply stunning. All of the minute details of the uniform are sharp and look completely natural, and the facial likeness to actor Peter Cushing is simply amazing. Even more impressive, the sculptor at Hasbro gave this figure thin, bony hands that look just perfect for the character. The elbows can’t bend at a full 90° angle, but the rest of the joints work reasonably well. 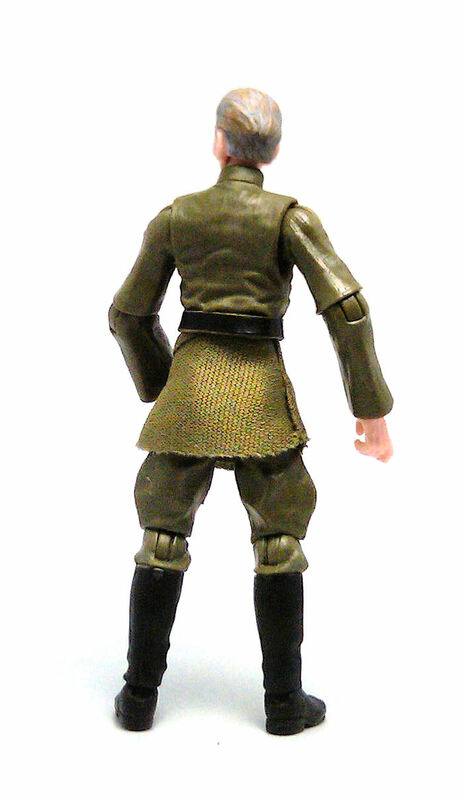 At this point I realized why they decided to go with a soft goods skirt instead of a plastic piece, and that is because Tarkin wears his belt rather high thus, having a plastic piece extending all the way down to the hips from just below the ribcage might have rendered the hip joints useless or would have required very obvious lateral cuts in the skirt piece. There is very little paint applied on this figure, since Hasbro has mastered the process of molding figures in their final colors consistently. The uniform has tiny silver details and red and blue buttons on Tarkin’s badge with Matte black paint applied on belt and boots. 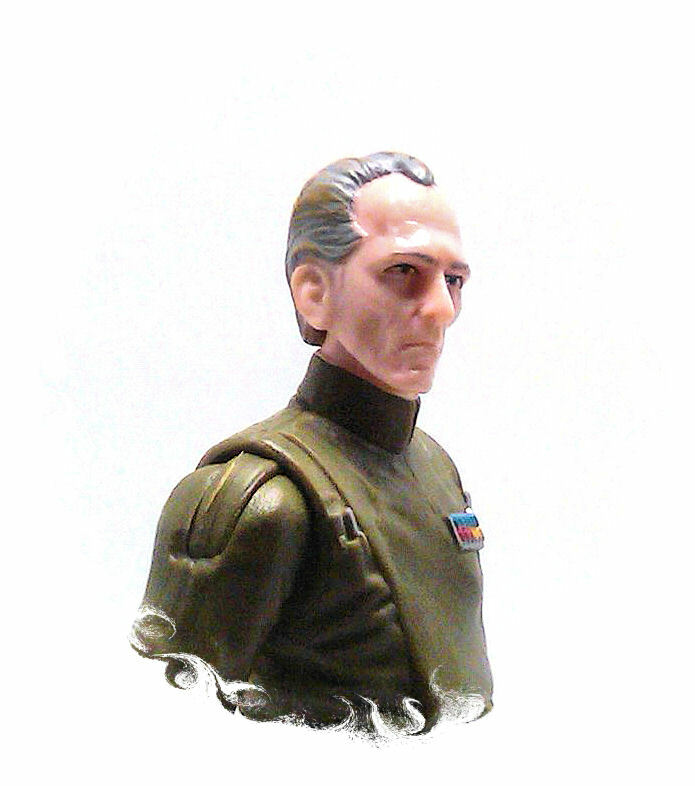 Tarkin’s hair is painted gray, but there are reddish brown highlights thrown in seemingly just for variety. Peter Cushing’s trademark stare is also nicely replicated here, although the light color of the plastic skin doesn’t always provide deep enough shadows to bring out the full Tarkin-ness of the portrait. 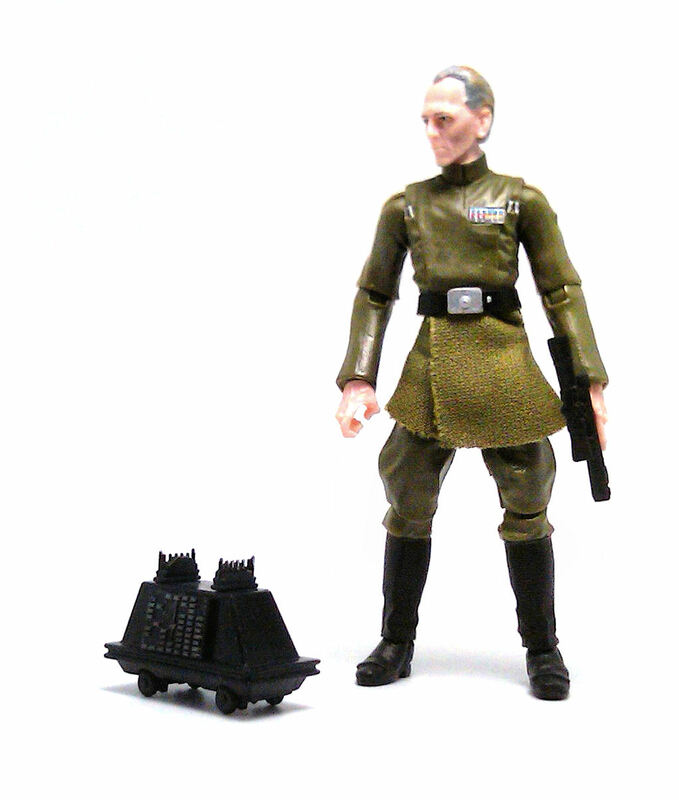 Grand Moff Tarkin comes equipped with a rather large blaster pistol and a newly sculpted Mouse Droid. 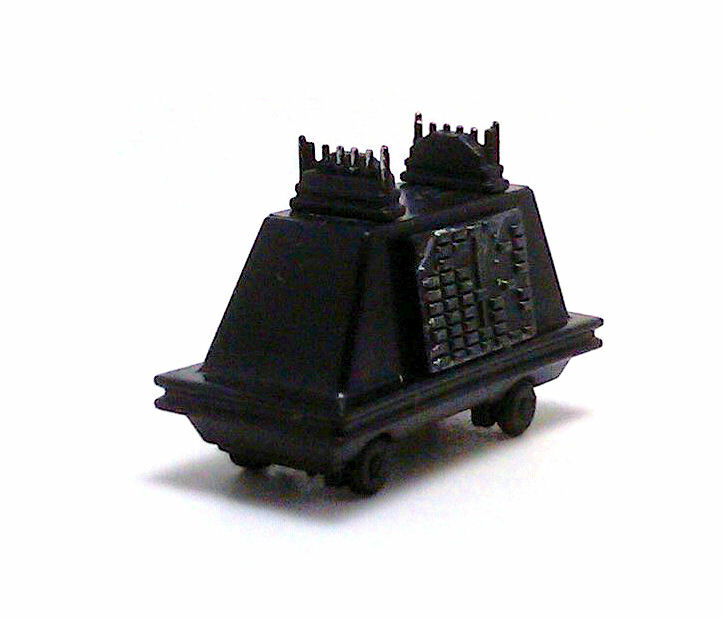 Both the gun and the Droid are molded in black plastic, but the Droid also has some gunmetal paint applications on its lateral panels, as well as fully functional rolling wheels. In the end I liked this rendition of Grand Moff Tarkin much more than I had anticipated, and I may even get a second one to customize as a vampire hunter sometime.